Renishaw Diagnostics Ltd, a subsidiary of FTSE 250 listed Renishaw plc, has won funding from Innovate UK to accelerate development of a diagnostic assay that will identify patients carrying bacteria resistant to an important last line in antibiotic therapy. Renishaw Diagnostics Ltd, a subsidiary of FTSE 250 listed Renishaw plc, has won funding from Innovate UK to accelerate development of a diagnostic assay that will identify patients carrying bacteria resistant to an important last line in antibiotic therapy. The development contract, worth £150,000, has been awarded as part of a £10M, two-phase competition to promote the development of new diagnostic products and services for use in stratified medicine. The project, to be carried out in collaboration with the Diagnostic Evidence Cooperative (DEC) and researchers at the Freeman Hospital in Newcastle, will develop a PCR based diagnostic test to identify patients carrying bacteria resistant to the carbapenem class of antibiotics, often considered the last resort in the treatment of many bacterial infections. The test will provide fast, reliable detection of the most prevalent gene families known to confer resistance and will allow testing of at-risk patients prior to hospital admission, supporting appropriate patient management and providing information for infection control. The competition aims to accelerate and/or increase the development and adoption of innovative diagnostic tools in order to offer better targeted treatment to patients within the UK healthcare system. It also aims to demonstrate the benefits of companies working within the UK ‘enabling infrastructure', which is made up of specialist organisations that can help companies understand healthcare needs and design, evaluate and deliver their products and services into the NHS. Renishaw Diagnostics Limited is part of the Renishaw Group, a world leader in engineering, medical device and spectroscopy technologies. 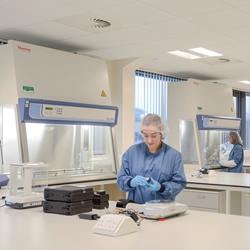 The company is focussed on the development and commercialisation of the RenDx multiplex assay system to provide automated, multiplex, high sensitivity in vitro diagnostics of infectious disease. The platforms first CE marked assay, for the detection of the most common causative agents of invasive fungal disease, was launched in 2015.